We’d love your help. 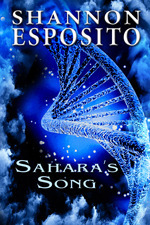 Let us know what’s wrong with this preview of Sahara's Song by Shannon Esposito. An ancient weapon has been found and reconstructed. It's already destroyed one civilization. Will ours be next? Sarah Raine is in over her head. She's been seduced into joining an experimental program that combines the hidden power of the mind with the power of sound. Helping plants grow with this new discovery is one thing, but by the time she realizes the destruction she An ancient weapon has been found and reconstructed. It's already destroyed one civilization. Will ours be next? Sarah Raine is in over her head. She's been seduced into joining an experimental program that combines the hidden power of the mind with the power of sound. Helping plants grow with this new discovery is one thing, but by the time she realizes the destruction she’s helping to create, it’s too late to get out. To ask other readers questions about Sahara's Song, please sign up.